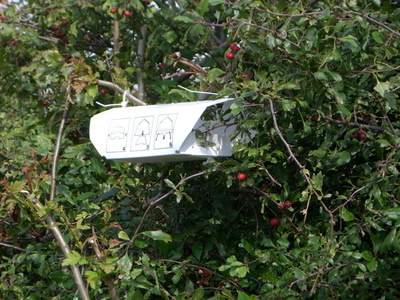 I was walking along the river Medway in Chatham and kept seeing these folded card boxes hanging on the trees. What are they? They could contain pheramone scent traps so that various fruit pests do not lay their eggs on the fruit. We use similar ones on our apples and plum trees. Or they might be webcams ... Big brother might be watching you! Bees need your help again! Bumblebee Conservation Trust need our help again! is there a partictular syrup i can buy to help bees survive. About bees living in garden.